A former reporter for "The Washington Post," Reel is the author of the critically acclaimed "The Last of the Tribe." "Engrossing....would go great with popcorn.....addresses big topics—evolution, abolition—but they remain in service of the narrative, providing context for colorful conflict." "Using extensive historical research, Reel brings alive this expedition and a later one and describes what happened between the two journeys....sense of urgency compels the reader onward to find out what happened....Arresting"
"A lively and intriguing biography of the restless adventurer who first sees, studies and takes specimens of gorillas....thoroughly engrossing." "Entertaining and provocative story of the life and adventures of explorer Paul Du Chaillu....[Reel] does a superb job of telling the engrossing story of Du Chaillu and tying it into the events and thoughts of the time, from the intense debate over racial differences in light of the theory of evolution to the habit of Abraham Lincoln’s political enemies of referring to him as a 'gorilla'....scrupulous in adhering to the facts....At the same time, it has the narrative flow and evocative language of a fine historical novel." "A supremely entertaining, enlightening and memorable read." "Reel paints each chapter of du Chaillu's life as a vivid scene worthy of the silver screen. They range in scope from the perilous adventures taking place within the jungles of Gabon to the equally tense academic battles waged by British high society. They are all rich with detail, dialogue and atmosphere thanks to the immense work Reel has put forth in researching du Chaillu's life. At times, the mind staggers to recall that this story is a work of nonfiction." "An admirable book for those who like epic tales of exploration.... Fascinating.... highlights once again the big issues that seem endlessly interesting to new generations of Americans, 'the evolution debate, racial discourse, the growth of Christian fundamentalism' in careful historical context and with a fine hand for thoughtful exposition." "Retelling his adventures opens a wonderful window, both magical and alarming, into what he [Paul Du Chaillu] saw and, ultimately, into who we are." "You’d half expect a Bela Lugosi mad scientist or a Johnny Weissmuller Tarzan to pop up in this Victorian-era drama, which travels from the London of Darwin and Dickens to unexplored Africa to Civil War-ravaged America." "Before there was Jane Goodall, or even Tarzan and King Kong, the gorilla was a creature of mystery....Reel retraces his life and work with the spirit of curiosity and adventure that drove du Chaillu in the first place. What results is a celebration of accomplishments too far-reaching to be understood in their time." "Adventure, history, nature, big ideas—what more could you want?" "Fascinating....A lively footnote to the debate between science and religion and the exploration of the African jungle in the Victorian era." "Those unfamiliar with [Paul Du Chaillu] would do well to pick up a copy of Between Man and Beast, Monte Reel's new book about Du Chaillu's life and adventures in pursuit of this fierce creature... Although Du Chaillu's checkered life story is the bedrock of this book, Reel builds upon it fascinating sketches of England's leading intellectuals, explorers and freelance eccentrics of the day, detailing not only their personal achievements but their professional jealousies as well." "Between Man and Beast is a rip-snorting adventure story, shot through with intrigue and absorbing intellectual history. Monte Reel is a wonderful writer, and he makes an expert guide to Paul Du Chaillu's groundbreaking travels in the wilds of Africa and his equally treacherous journey through the scientific salons of 19th century London. By weaving Du Chaillu's pursuit of the gorilla with the debate over evolution, Reel has given us a true 'missing link' that connects exploration, science, and literature. Readers will embrace Du Chaillu and root for him every step of the way/"
"Part swashbuckling jungle story, part gaslit Victorian time capsule, Monte Reel's visceral, captivating book restores a forgotten hero to his rightful place in history." 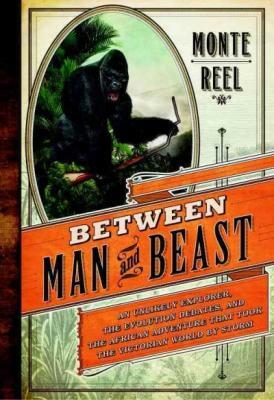 "Monte Reel’s BETWEEN MAN AND BEAST is a provocative, entertaining, and original adventure narrative."